The case is fairly lightweight, and the aesthetic is not bad. It has a slightly aggressive styling, which makes it look nice under the desk. Placement and USB port availability of the front header is the major limiting factor of the GRAM. Using the header is clumsy and affects the look of the case. This case certainly has its market, and its price makes it fairly attractive. Before considering the purchase, though, make sure you aren't going to grow out of it quickly, and that items plugged into the USB ports won't catch on your chair. The look of the case is fairly standard, as you might expect from a case in this price category. 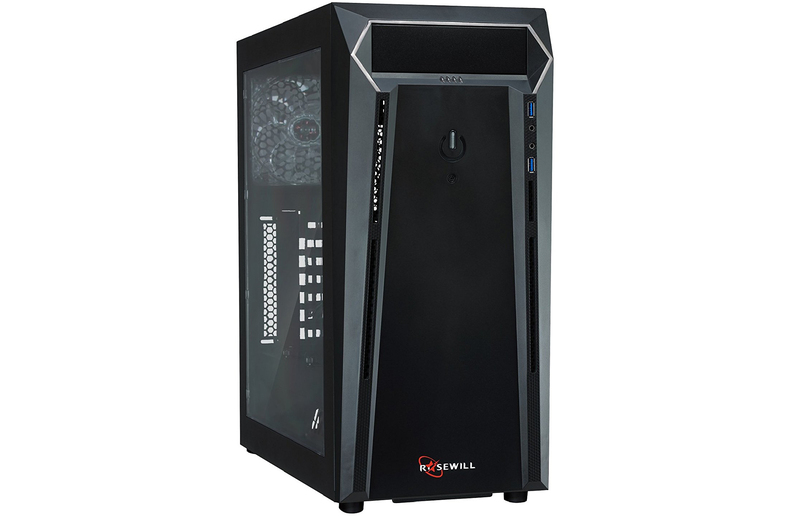 However, Rosewill has added some design elements to make it more appealing than a standard black box. The acrylic side panel is nice, but not particularly unique in the industry. Where the case really stands out is the front panel. Sharp lines and no soft contours makes this case look like it was designed in the style of an 70s American muscle car. Unfortunately, they tried to do too much with the front panel, almost hiding the header panel and activity indicators. These important elements all face forward instead of up, making them difficult to access unless the computer is on top of the desk, as well as detracting from the aesthetic lines of case. These features would be better positioned on the upward slant just above the external drive bay. Internally, the build of the GRAM is of a high quality. All of the joints and weld points are in place, and the frame of the case is sturdy. All of the spacing for motherboard mounts are proper, the drive bays are secure and everything fits snugly, as it should. On the outside, however, there are some problems. None of the movable parts have level seams. The side panels, once removed and replaced, do not fit together perfectly. Even in the company's own marketing image on Amazon, the side panels rise slightly above the top of the body, and extend slightly beyond the back panel. This leaves two exposed aluminum corners that could easily snag on clothing or other fabric. There is also a strange spacing around the external drive bay door, making the clean, sharp lines of the fixed components lose their effect. The GRAM works as advertised. The fans are quiet and powerful, clearing a lot of heat out of the case in an efficient manner. We moved our studio computer out of its former case and into this one, and the computer functions slightly more efficiently because of the additional cooling. More importantly, the fans are quiet enough to not get picked up on our microphones even with the computer exposed to the room. The real disappointment, though, is the front header. Its placement makes accessing the ports difficult, unless the computer is sitting on top of your desk. Ten years ago this might have worked but today, most people keep their towers below their desks to save work space. For a more consumer-oriented case, the GRAM supports a wide array of capabilities, but not as much as one might expect considering its size. It supports two 3.5", two 2.5" and one 5.25" external facing drive bay. It has space for seven expansion slots and up to a 200mm power supply. The case also has room for up to two more fans, making a total of four. Unfortunately, despite advertising room for a radiator within the case, there are no external hose ports, making high-efficiency water cooling not an immediate option. To accomplish it, you would have to custom cut holes in the back of the case to support external hardware. The design of the inside of this case makes hardware installation fairly easy. An issue we had with the Rosewill CULLINAN case where the rubber grommet between the power supply and motherboard opening was not present in this one. The lip that holds that grommet in place seems to be wider, which keeps it in place while running cables through it. That was a nice change of pace, because that piece was not easy to put back into place. As with many cases with metal side panels, getting them back on can be a challenge. The GRAM is no exception to this trend. When cables are run, they can get caught in the teeth that hold the panels onto the body, making it an adventure to wrangle the wires and the teeth. Luckily, the wire management included with the case made most of this a non-issue, and certainly easier than many other cases on the market in this category.